For optimum sky-watching, there is a single important rule: the darker your surroundings, the better. Parks are good; rural locations are preferable. High places, with little tree coverage are ideal. A wide, open clearing away from artificial light will maximise your view of the sky. Be prepared to spend up to thirty minutes letting your eyes properly adjust to the night if you want to see the fainter stars. Also be warned that even in night mode, a smartphone screen will kill your night vision. If you need to use it, install a blue light filter and crank it all the way up until the screen is the reddest red. This will reduce the effect it has on your adapted eyes. 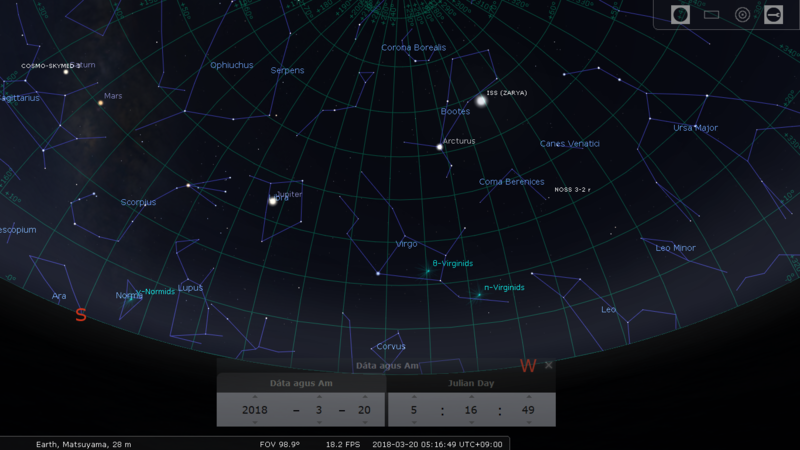 Most night sky apps come with a special red light mode for just this purpose, such as ‘Sky Map’. Of course, the Moon, the planets and many bright stars are visible even in the middle of a city. Try to avoid streetlights, or in a pinch, do your best to block them from your view with your hand. Believe it or not, this is a genuine astronomical technique known as occulting: removing bright objects from the field of view by covering them up so as to better see the fainter ones. You may need to navigate around buildings to catch everything the sky has to offer. But if you’re lucky enough to have a southwest-facing balcony up high enough, put a deckchair on it and enjoy the star-studded tapestry of the night. 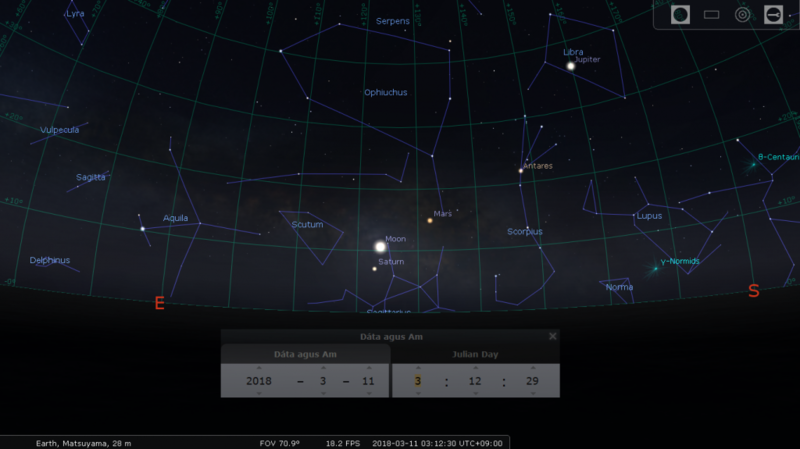 Failing that, if it’s still too cold to go out, why not try Stellarium. It’s free and open-source, available for PC and Mac. Once you set your location, it’ll show you the sky around you immediately. You can then adjust the time freely. This means it’s great for getting a feel for how things in the sky move. Set it to fast-forward through a few months and watch the sky change as we spin through space. It’s a lot of fun to play with. You can also explore constellations from different cultures, from the Egyptians to the Chinese, if you’re interested in how humans have interpreted the stars in the past. There’s a lot to see and it’s interactive – you can click on an object to get a name and some information. Some of the sky cultures have constellation art which can be projected over the stars, giving meaningful shape to the random patterns in the sky. Of the manmade objects in space, the most impressive is undoubtedly the International Space Station. Watch it fly high and fast through the sky from Northwest to Southeast on the morning of the 20th between 5:15 and 5:20 a.m., Japan Standard Time. It’s bright and moves much faster than any other visible object in the regular sky. It also happens to be the only object you can currently look at and say “That’s got people in it!”. There will be other passes in March but none as spectacular as this one. Most will be nearer the horizon and thus more difficult to see. There are other satellites visible to the naked eye too. Of these, the North Korean satellite may be of particular interest. There is a website, Heavens Above, which provides times and directions. The ISS, labelled ISS (ZARYA), partway through its pass on the morning of the 20th. From rising to setting, it will only remain in the sky for about five minutes. It’s something of a special month for the Moon. You may remember the ‘Super Blue Blood Moon’ on January 31st of this year. It was, in fact, the second supermoon this year, owing to the Moon still being at its closest to Earth in its orbit. In addition, it was the second full moon, making it blue in name. In colour, it would have appeared more red, as the Sun’s light was eclipsed by the Earth, conferring the title blood moon. While not quite as impressive as all that, there is another blue moon this year, on the 31st of March. The occurrence of a second blue moon in a year is quite rare, only happening once in every 20 years. It coincides with there being a black moon in February, which means there was no full moon at all during the shortest month this year. If you’re actually more interested in seeing the Moon than labelling it, the very beginning and end of this month are best. It will be full on the 2nd and visible for pretty much all of the night. From then, it will begin to wane, while also rising gradually later, becoming visible only in the early mornings around mid month. It will then slowly return to the evening sky and begin to wax again until the second blue moon on the last day of the month. Check out that rabbit making rice cakes! Those of you from the Southern Hemisphere may or may not have noticed on moving to Japan that the Moon is backwards here. That might explain why you’ve never seen a rabbit making rice cakes back home. In the North, it waxes from right to left, whereas in the South, this is reversed. This is because, relative to a Northern observer, a Southern one stands “upside-down”. And even in the same hemisphere, one can see differences in the orientation of the Moon. Anyone from Northern Europe, Canada or anywhere reasonably further North than Los Angeles or Beirut, Lebanon – cities sharing Matsuyama’s latitude – may observe that the Moon appears rotated. This is because you’ve moved nearer to the Equator. The effect is best seen immediately after the Moon rises or just before it sets. It can be seen as a “smile” in the early evenings, instead of the left/right crescent described above. When the Sun is above the Moon in the sky, the crescent’s tips point downwards instead, though this only occurs during the day. This month is also a great time to see Jupiter, king of the planets. Look Southwards before dawn for the best view. It will be following the Moon from East to West until it eventually overtakes it, between the 7th and 8th. The Moon and Jupiter. By midnight on March 8th, they should have risen sufficiently to be visible above the horizon. From here, they will continue to rise up and move slowly South until disappearing in the dawn light. 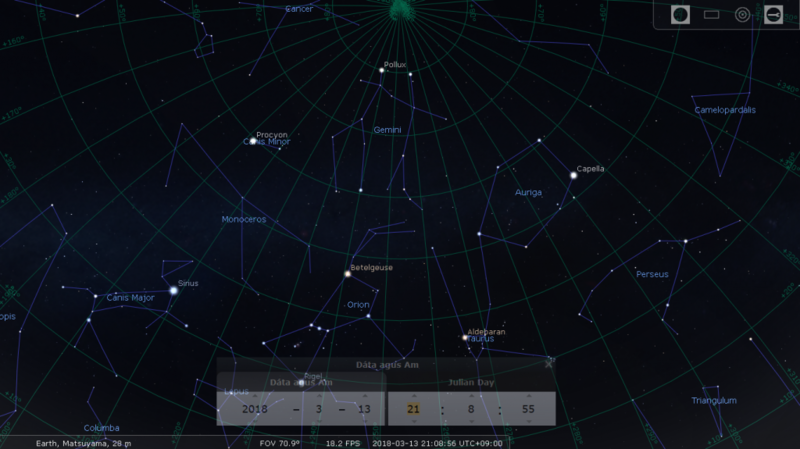 All images used are screenshots from Stellarium. If you have difficulty spotting it, use the early morning of the 7th or 8th to find the brightest “star” near the Moon. It should be just below the Moon on the 7th and will transit from left to right of her between the two days. This is also a good opportunity to see Jupiter’s subordinate, Mars. It will be trailing behind Jupiter, to the left and down. Watch as the Moon passes by Mars on the 10th. If you’ve got very good eyes and can get up high, away from city lights, you may also just be able to spot Saturn near the Moon on the 11th. Saturn and Mars will seem to get closer and closer, as they move towards conjunction early next month. The Moon, Saturn and Mars, not long after rising to the South-East, early on the morning of March 11th. For those of us who are more of a night owl than an early bird, Venus will become visible low in the West, just after sunset, in March. Later in the month, it’ll be even easier to see as it drifts away from the bright light of the setting Sun. It’s just beginning to make the swap to evening star from morning star. 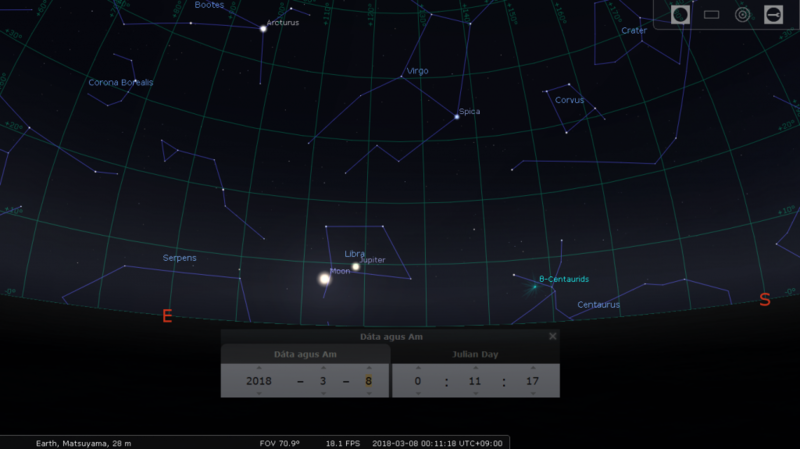 Even though it’s been at the furthest point from Earth recently and is just beginning to come closer, it remains the third brightest object in the sky, after the Sun and Moon. Try and spot nearby Mercury too, as it gradually draws away from Venus through the second week of the month. There’s a nice triangle to be formed on the 19th, low in the West between the two evening stars and the thinnest sliver of crescent Moon. 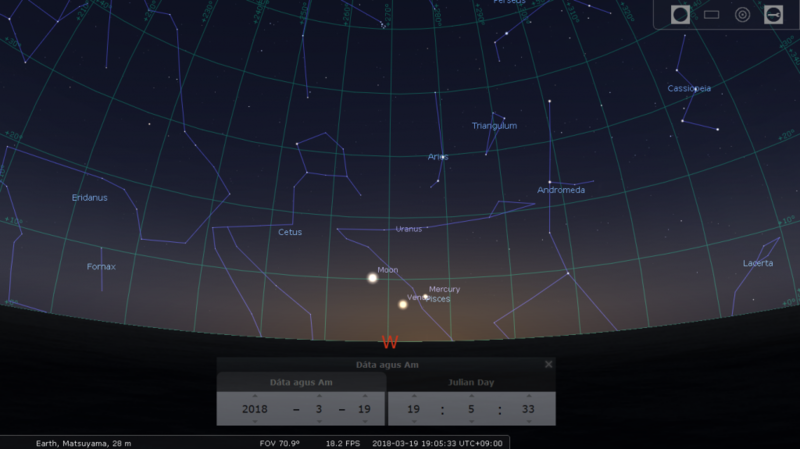 The Moon, Venus and Mercury form a triangle just after sunset on March 19th. The red W denotes due West. Observe Cassiopeia, a fairly distinctive constellation, in the upper right. While you’re keeping an eye on Venus, why not see if you can recognise a constellation or two. Right now, Gemini is nearest the apex of the sky, the best location for viewing. Orion is just below and notably easy to spot. From the three stars of Orion’s belt, look up past Betelgeuse and carry on in an almost straight line to the top of the sky. There, look for Pollux, the brighter of the twin stars. It has a slight orange colour, unlike its younger, dimmer sibling Castor, which appears blue-white. In fact, Castor itself is a multi-star system, a set of sextuplets, though these can’t be resolved with the naked eye. Gemini sits above Orion, who is chased by Canis Major, the big dog. Pollux, Betelgeuse and Sirius are all easy stars to spot. Note the date and time near the bottom of the screen. Sirius is another bright and easily recognisable star that should be in plain view. Trace a line leftwards through Orion’s belt and about twice as far as Betelgeuse. Sirius is known as the dog star and is the brightest star in the night sky. From there, turn due North and see Polaris, the ever-reliable North Star. It stays in a fixed position, right at the north celestial pole. Unlike other stars, it doesn’t appear to move over the course of a night. It’s also not usually visible from the Southern Hemisphere because of where it lies in the sky. I hope this inspires you to get better acquainted with the starry canopy of the night. It can be daunting to look up at a scene that is mostly void and try to become familiar with it, especially to begin with. Having a few easy targets to start from, in particular the planets and Orion, is a great way to go about learning to read the night sky. This can lead in turn to being able to recognise some common features appearing in it, and allow you to better appreciate the beauty of the heavens. All images used are from the free, open-source software Stellarium. Ciaran is a second year ALT in Matsuyama city. Originally from Ireland, he studied Astronomy at university before coming to Japan.